As recently as September, ultra-secretive augmented reality startup Magic Leap entertained holding a splashy event to reveal more about its mysterious technology, according to a confidential document detailing a proposed event concept obtained by Gizmodo. The document outlines a pitch for a strange live-streamed office tour, complete with product-revealing Easter eggs, nods at various Magic Leap partners, and a handful of very famous people to bump into. All these maddeningly vague descriptions of technology beaming light onto your eye sound cool, but they also sound like they’re based on prototypes that are years away from consumer availability. A leaked photo of a clumsy prototype which circulated earlier this year seemed to reinforce that notion. A typical Magic Leap concept video. Recently, though, evidence that Magic Leap is finally going to share its secrets has started to pile up. News broke last week that Magic Leap picked up another $500 million in funding, presumably after having shown investors something to be excited about. A few weeks before that, the company released a minimal website redesign with hidden messages hinting at something on the horizon. The redesign first carried a simple message that said the company wants to take “you with us on this journey to launch. More to come…” Shortly after that, a video titled How It All Began was embedded on the company’s website. The video features members of the Magic Leap team and a voice-over narration espousing a philosophy based on creativity and realizing the impossible. Finally, the persistent rumors of a coming software developer kit have ramped up, with Business Insider most recently claiming that it’ll be out by the end of the year. The 41-page document reviewed by Gizmodo is dated September 25th, and seems to indicate that after years of secrecy, Magic Leap is getting ready to go public with more information. The document bears the logo of The Community, an A-list creative agency with offices in Miami, Buenos Aires, and London, and language throughout suggests that it’s more of a pitch for a Magic Leap event, rather than a fully baked plan. When money-flush companies like Magic Leap plan events, they typically put out a request for proposals from event production agencies. The resulting proposals are usually over-the-top, best-case-scenario pitches to give the company a sense of the tone of the proposed event. The proposal process is a bit like a competition to gain the company’s business, with the best pitch moving forward. Often, the final event will have substantial changes from the original pitch. It’s possible that the event pitched by The Community did not progress beyond this pitch stage. One slide hints at an October 24th date for the livestream event. Separate communications seen by Gizmodo propose a later date, November 15th, for the potential event. Reached for comment a Magic Leap spokesperson said that there would be no Magic Leap livestream event in November. They declined to comment on the authenticity of the document and would not comment on whether a livestream event might happen another time. The Community did not respond to a request for comment. The astronaut character is the guide through Magic Leap HQ. The astronaut is one of at least three symbols that Magic Leap has been using as an indicator of its brand, the other two being a whale and the “Leaper” logo. A BEAM bot will be controlled by the audience in a Twitch Plays Pokemon-style. It will travel around the HQ and celebrities will appear on other BEAM bots throughout the space. Following a clearly defined path is key to showing only what Magic Leap wants you to see. The specifics contained within the document are consistent with Magic Leap’s cryptic stagecraft in the past. It proposes that the livestream event should show off what’s literally going on inside the walls of Magic Leap—that is to say, an office tour. An Easter egg-laden office tour with the biggest Easter egg teasing a peek at what the Magic Leap hardware device might actually look like. The document describes how fans will “follow the white rabbit”—a guy in an astronaut suit—through Magic Leap’s office space with a Beam telepresence robot. 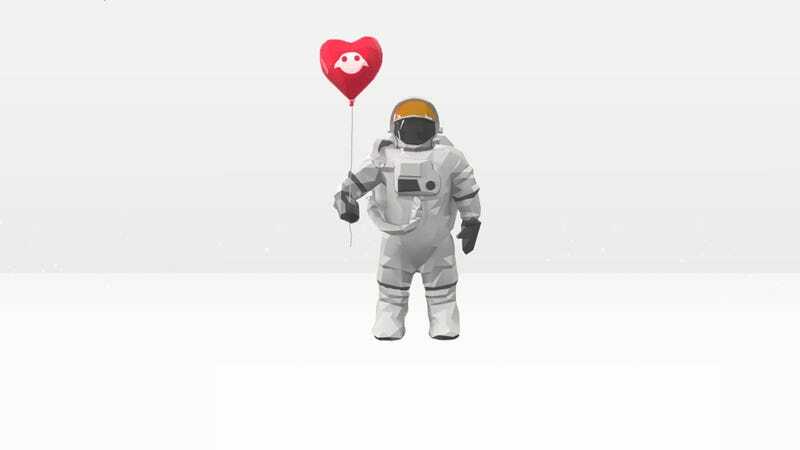 The astronaut is one of at least three symbols that Magic Leap has been using as an indicator of its brand, the other two being a whale and the “Leaper” logo. The document contains detailed schematics of what is presumably Magic Leap headquarters, including the location of various departments and demo rooms, as well as a seating chart labeled with the first names of many top Magic Leap executives. The livestream will consist of three chapters: In the first, fans will get an introduction to the company, in the second, they’ll get to know the “brains behind the dream,” and in a third, the stream will deliver a final “reward” for fans. A series of numbers will be painted throughout Magic Leap’s headquarters that are gradually seen through the livestream. The nine digits will ultimately form a phone number that when texted will return a photo of the Magic Leap device. The most important thing of all is a series of numbers that would be planted throughout the three-chapter tour, which will combine to form a phone number. If viewers call the number, they’ll hear the sound of a whale, a symbol that Magic Leap is trying to associate with its brand. But if viewers text the number, they’ll receive an “alternate image of the device” delivered to their phone. While it’s unclear just what that framing means, it appears that the stream is intended to end with at least some kind of hardware reveal. Make what you will of those leaks. Some of the people that the doc suggests viewers might encounter over the course of the live stream work for Magic Leap like Neal Stephenson, the author of the sci-fi classic Snow Crash. Stephenson holds the title of “Chief Futurist” at the company. Executive Creative Director Andy Lanning, a famed a comic book artist who’s worked on titles like Guardians of the Galaxy, is also listed in the doc. Company founder Rony Abovitz is also mentioned throughout, and a section of the livestream is dedicated to exploring his “office and personal collection.” And Tim Sweeney is mentioned, the Epic Games and the Unreal Engine founder who has been bullish on Magic Leap. Amusingly, the pitch document proposes what would most likely be extreme long-shot celebrity appearances, some of whom are supposed to appear on Beam bots. Of those, Lord of the Rings director Peter Jackson, makes the most sense since his visual effects company WETA has had a long partnership with Magic Leap. As for Curry, Obama, and Spacey, none has any previous relationship to Magic Leap. Curiously, for all the effort that would be required to actually execute this event, as pitched it actually wouldn’t reveal all that much about what’s going on inside the company. If this event were to happen, it would only serve to stoke more curiosity about a technology that almost no one has tried. And from the looks of it, none of us will any time soon. A selection of “scene” descriptions from several slides. The pitch is always about providing an illusion of access, but everything would ultimately be highly managed. Correction: a previous version of this article listed Tim Sweeney as “Chief Game Wizard” at Magic Leap. Sweeney does not hold a formal title at the company. The actual wizard title is held by Graeme Devine. Do you know what’s really going on at Magic Leap? Drop us a line: rhett.jones@gizmodo.com.